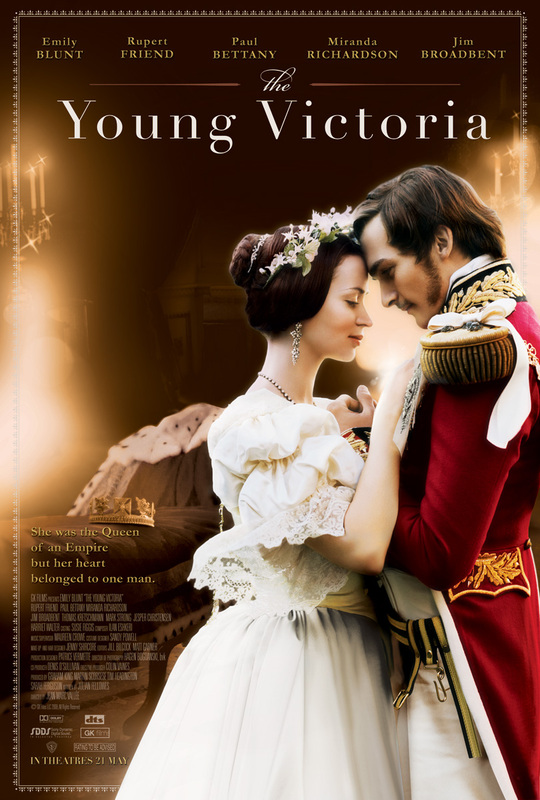 The Young Victoria paints a picture of Victoria’s life before and during her reign. We begin in her childhood, where she lives under the control of a highly overprotective mother and a possessive regent. We then see her grow into a teenager and then a woman, courting her German cousin Albert and eventually taking control of her own life and reign. The most striking thing about this film is its visual aspects. The costuming is absolutely gorgeous and very elaborate — well suited for a film about the monarchy. Much of the film was shot inside of the very same buildings where the real Victoria spent her time, which of course make for phenomenal sets. In addition to the film’s visual beauty, the performances are also pretty solid. Emily Blunt makes a very likable Victoria. She humanizes the legendary queen and makes the character easy to sympathize with, especially early on in the film when her family is trying so desperately to control her. Of course, some liberties are taken with the true history of Victoria and her reign for dramatic effect, which is to be expected with any fictionalized historical drama. For instance, Albert was never wounded during an assassination attempt on Victoria (though there were assassination attempts); Melbourne appears much younger in the film than he actually was in comparison to Victoria; Victoria’s mother didn’t actually leave the room in embarrassment when Victoria’s uncle called her out at the dinner party, and the list goes on. These errors are generally forgivable because the scenes as a whole are still based in fact, and in most cases only smaller details are changed. It’s a lot more factual than most films of its type. I’ve been umming and ahing about watching this one. Sounds like I should. I would watch it again for the visual elements alone! I’d say it’s definitely worth your time. I agree, this is an awesome period film. Really gave me a sense of their love and the challenges facing a princess! I haven’t seen that one. I’ll have to add it to the “to watch” list! Apart from having the longest reign in British history (63 years), Queen Victoria also holds two other distinctions. She was, apart from our current Queen, the oldest ever British monarch, living to the age of 81. And she was also the youngest ever British (as opposed to English or Scottish) monarch, coming to the throne as a girl of eighteen. And yet whenever television or the cinema make a programme or film about her, they seem far more interested in the older Victoria than they do in the young girl; the version of Victoria with which modern audiences will probably be most familiar is Judi Dench in “Mrs Brown”. “The Young Victoria” tries to redress the balance by showing us the events surrounding her accession and the early years of her reign. It has the rare distinction of being produced by a former Royal, Sarah Duchess of York, whose daughter Princess Beatrice makes a brief appearance as an extra. There are three main strands to the plot. The first concerns the intrigues of Victoria’s mother, the Duchess of Kent, a highly unpopular figure even with her own daughter, largely because of the influence of her adviser Sir John Conroy, who was widely rumoured to be her lover. (According to one unfounded rumour he, and not the late Duke of Kent, was Victoria’s natural father). The second strand concerns the growing romance between Victoria and her German cousin Prince Albert, and the attempts of King Leopold of Belgium, who was uncle to both of them, to influence this romance. (Leopold’s hope was to increase the prestige of the House of Saxe-Coburg, to which both he and Albert belonged). The third concerns one of the strangest episodes in British political history, the Bedchamber Crisis of 1839, when supporters of the Tory Party (which had traditionally supported a strong monarchy) rioted because the young Queen was perceived to favour the Whig Party and their leader Lord Melbourne, even though the Whigs had historically supported a quasi-republican system of government, with the monarch reduced to a figurehead. Scriptwriter Julian Fellowes is known for his Conservative views, and at times I wondered if this may have coloured his treatment of political themes, as he seems to lean to the side of the Tories, the predecessors of the modern Conservative party. Their leader Robert Peel is shown as statesmanlike and dignified, whereas Melbourne, for all his dash and charm, is shown as devious and uninterested in social reform. There may be some truth is these characterisations, but Fellowes glosses over the fact that only a few years earlier the Tories had opposed the Reform Act, which ended the corrupt electoral system of rotten boroughs, and that they had benefited from William IV’s unconstitutional dismissal of a Whig administration. Lessons in dynastic and constitutional history do not always transfer well to the cinema screen, and this one contains its share of inaccuracies. Prince Albert, for example, was not injured in Edward Oxford’s attempt on Victoria’s life, and Melbourne (in his late fifties at the time of Victoria’s accession) was not as youthful as he is portrayed here by Paul Bettany. King William IV certainly disliked the Duchess of Kent (who was his sister-in-law), but I doubt if he would have gone so far as to bawl abuse at her during a state banquet, as he is shown doing here. I also failed to understand the significance of the scene in which the Duchess and Conroy try to force Victoria to sign a “Regency Order”; the Duchess’s constitutional position was made clear by the Regency Act 1830, which provided that she would become Regent if her daughter was still under eighteen at the time of her accession. No piece of paper signed by Victoria could have altered the provisions of the Act. There are also occasional infelicities. In one early scene we see Victoria and Albert playing chess while comparing themselves to pawns being moved around a chessboard, a metaphor so hackneyed that the whole scene should have come complete with a “Danger! Major cliché ahead!” warning. Yet in spite of scenes like this, I came to enjoy the film. There were some good performances, especially from Miranda Richardson as the scheming Duchess and Mark Strong as the obnoxious Conroy. It is visually very attractive, being shot in sumptuous style we have come to associate with British historical drama. Jim Broadbent gives an amusing turn as King William, although he does occasionally succumb to the temptation of going over the top. (Although not as disastrously over the top as he was in “Moulin Rouge”). The main reason for the film’s success, however, is the performances of Emily Blunt and Rupert Friend as the two young lovers Victoria and Albert. Blunt is probably more attractive than Victoria was in real life, but in her delightful portrayal the Queen is no longer the old lady of the popular imagination, the black-clad Widow of Windsor who was perpetually not amused, but a determined, strong-minded and loving young woman. Her love for Albert, and their happy family life together, was one of the main reasons why the monarchy succeeded in reestablishing itself in the affections of the British people. (With the exception of George III, Victoria’s Hanoverian ancestors had been notoriously lacking in the matrimonial virtues). Blunt and Friend make “The Young Victoria” a touching romance and a gripping human drama as well as an exploration of a key period in British history.